[Patreon-Nov16-Post-Bug][/Patreon-Nov16-Post-Bug]WildCATs hasn’t been my favorite title to cycle through in this marathon of reading, but I’ll read just about anything to enjoy Jim Lee art. 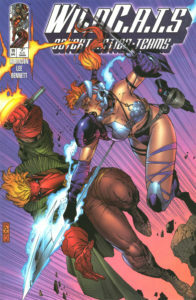 So, you’ll understand my trepidation about today’s read when I remind you that of WildCATs #15-19, Jim Lee contributes only to #19, and then only the layouts with Richard Bennett on finishes. What I had forgotten about these issues was who took over for Lee and his BFF Brandon Choi on scripts – Travis Charest on art, with James Robinson scripting. Robinson is the obvious good sign. While we didn’t know it at the time, he had begun something truly historic the month WildCATs #15 was released … and it wasn’t WildCATs! Robinson also began his legendary, Eisner-nominated, 80-issue run on DC’s Starman the same month. Since then he’s become well-known as a sort of historian archeological scripter, a writer who will dig through all the layers of a character’s lengthy history to find the bones that fit together best into a new story. We last saw Charest on WildCATs #0, Special, and back-ups on #8-9, where he was a reliable Lee clone. In the year that elapsed he must have been pricked with a radioactive pencil or something, because his artwork here is something else entirely. It’s the first time so far I’ve opened up a WildStorm book and felt it was not just exciting or dynamic or challenging, but beautiful. 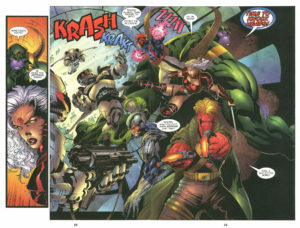 Charest’s pencils with inker Troy Hubbs are so far ahead of their time for 1994, made all the more remarkable by what colorist Joe Chiodo was achieving with 90s technology. I’d hold up the quality of the art in these issues to peak John Cassaday or Travel Foreman. They’re that good. There’s a certain stained glass quality to his figures work, where it feels like he’s defined each distinct plain of their features while still keeping them round and dynamic. The combined powers of Robinson, Charest, Hubbs, and Chiodo pull WildCATs out of the middle of the pack of Image books and makes it a proper must-read. Part of Robinson’s method of doing that is zooming out from the team for his first arc (and also taking Voodoo off the table until he has the chance to do some repairs). His first arc is told from the point of view of a random Black Razor who had his knee shot out by Jacob Marlowe back in issue #2. Now he’s leading the Razors in lieu of Lynch (which places this just after Gen13) and his first mission is to protect the man who nearly crippled him. Seeing Marlowe and his team of lethal, unleashed warriors through the eyes of the humans who have to keep them contained completely changes the nature of this book. Finally, Warblade and Maul seem powerful and fantastical. Zealot, despite being a whirlwind of blades and death, seems more human and fallible when we’re not relying on her to save the day as a necessary function of the plot. Then, Charest takes center stage with a puzzle of a structure from Robinson on issue #17, expanding three branching stories symmetrically first in vertical slices on the same page, then in single page splashes, and finally in full page spreads. Finally, Robinson gets out his archeologist tools and goes to work on Voodoo – and, to an extent, Void. 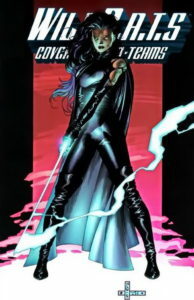 Much as WildCATs Trilogy made Zealot a dynamic character through defining her history, Robinson makes Voodoo’s sudden dedication to being a fighter real and grounded in a psychic dream sequence that explains that she is not only part Kherubim, but also part Daemonite – maybe the only person on Earth who can claim such a lineage! It’s phenomenal stuff, especially since Robinson plays to Charest’s best strengths and uses issue #18 (and parts of #17) as a series of pinups. It’s unfortunate to see the legs get swept out from under it so soon with the end of #19 leading directly into the WildStorm Rising crossover. I know all good fiction is about interrupting the “Status Quo,” but when it comes to comic books it’s disappointing to get only five or six great issues before an event shakes things up. Want the full details? Keep reading for a deeper breakdown of the plot. Here’s the schedule for the rest of this month’s WildStorm re-read. Tomorrow we nip over to Wetworks #4-7 (which occur before this arc!) 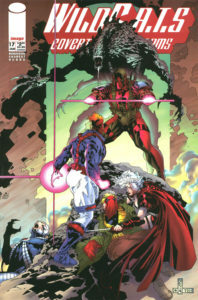 before a second dose of WildCATs with Warblade: Endangered Species (1995) #1-4 & Grifter: One Shot (1995) (plus the WildStorm Rarities Maul story I originally planned to cover today). Need the issues? 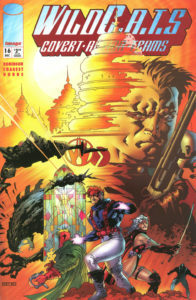 These issues were collected in 2009’s James Robinson’s The Complete WildC.A.T.s, ISBN 978-1401222048 (Amazon / eBay). For single issues – try eBay (#15-19) or Amazon (#15, 16, 17, 18, 19). Since other WildCATS series hit these same issue numbers, be sure to match your purchase to the cover images in this post. 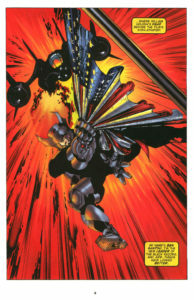 WildCATs #15 opens with nearly a repeat of a scene from Erik Larsen’s Image X-Month issue. Marlowe has been called up by the US government to work on ecological policy, and he thinks it’s time the team had a rest. There’s never any rest for the righteous, as right on cue an enemy CAT ambushes them, severely wounding Voodoo. We shift focus to Ben Santini, the new leader of the Black Razors, who is briefing his team on a string of assassinations of high-profile industrial leaders. Some of them were high-profile terrorist attacks, but others were seemingly unsolvable crimes committed by people with an alibi that seem to point to the handiwork of a shape-shifter. His team is free to roam but on call at a moment’s notice. The call comes (courtesy of a now-dead informant) and the Razors manage to save a well-known businessman (thanks to some death-defying moves from Santini himself), but not from a shapeshifter. They manage to interrogate a member of the team that was sent to kill him and learn that the shapeshifter is already in deep cover on their new assignment – infiltrating the WildCATs to get to Marlowe. WildCATs #16 takes us through a Razor training session, where we learn members of the team have different reasons for chafing under Santini’s leadership. As a young gun who served beside them, they think he’s entire unlike the cold, calculated Lynch. Despite that, his plan to find the shapeshifter is Lynchian in its brutal simplicity. At this point IO has established a file on each member of the WildCATs and their fighting style. All the Black Razors need to do is the live through enough of a fight with the WildCATs while Santini hangs back watching the data until the shifter to expose him or herself – that is, if they can’t perfectly replicate the moves of their subject. As if the plan isn’t dangerous enough to begin with (the CATs don’t especially pull their punches), the Razors’ ambush is interrupted midway by another ambush – Daemonite agents, who’ve taken down their comm system! This, just as Santini figures out who the shifter is impersonating. He takes it upon himself to leap into the battle without armor, knowing that he’ll have just one shot at taking the shifter down. He calls out to Grifter – and, as readers, we’re meant to think he’s the one who has been replaced. However, Santini’s shout isn’t a challenge, but a leap of faith that Grifter might pick up on his desperation and cover the shifter’s quarry while Santini takes his shot… at Maul! It turns out that Maul is the Mister White we saw Defile prepping in Stormwatch. But, where is Maul…? 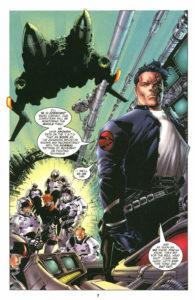 WildCATs #17 finds the team shaking down every possible Cabal informant to try to learn Maul’s whereabouts. We readers are already a step ahead of Marlowe and the gang – we’ve already guessed that it really was Maul who – naked, purple, and enraged – climbed King Kong style up an active volcano and caused Battalion’s death in StormWatch #16. 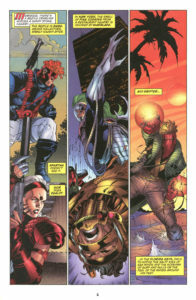 Grifter, Spartan and Zealot (which is oddly satisfying), and Warblade (who is extra fierce here versus Pike) are each stalking different targets, while Marlowe and Void coordinate back at home and keep tabs on Voodoo’s health. As each of the trio of missions comes to a climax, we cut away to check in briefly on Savant (back to archeology), Soldier (back to barroom brawls), and Majestic (back to heroism!). 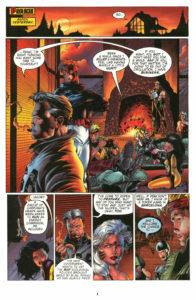 As it turns out, the shakedown missions were unnecessary, as Void figures out how to make hot psychic communion with a super-computer and comes back with the answer that Stormwatch has Maul, which they probably could have figured out by turning on the news. Void ports the CATs out of their various conflicts (just as Zealot was about to learn more about Defile!) and then fetches Maul from Skywatch like it’s a trip to the corner store (in a story that is mirrored in Stormwatch #18). We end the issue in an IO morgue, where Mr. White’s body is not especially secured – not that any security could have stopped Defile from breaking in and resurrecting him! In Voodoo’s mindscape, Void finds no trace of her friend in the superficial chambers full of dancers and music, but in the rooms beyond. There, a Coda-esque Voodoo fights alongside a chrome-plated Spartan, turning back an infinite number of monstrous replicas of the team. The pair fight as if they are stuck on a treadmill, able to just defeat each wave of attack before another one presses them. Void joins the skirmish, and they manage to advance to fighting straight up Daemonites before finally advancing to a chamber that was like a storybook on infinite loop playing Voodoo’s entire genetic history. 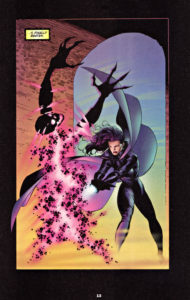 There, both Voodoo and Void learn the truth of Voodoo’s powers – she is able to see Daemonites because she is part-Daemonite herself, the descendant from a unique BC-era Daemonite experiment to interbreed with Kherubim. The issue ends with Voodoo emerging from her coma and Grifter calling in. He’s tracked down their old foe Hightower to a Coda stronghold in Washington DC. 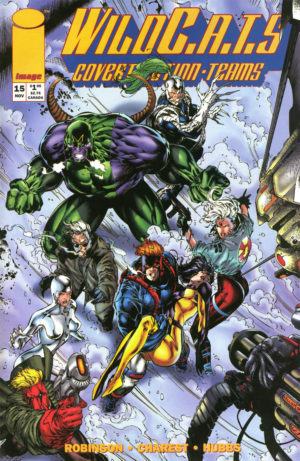 WildCATs #19 is almost all fight, with the team conducting a full-on frontal assault against the Coda compound only to see Hightower slip away and the place be blown to dust, only to discover the Diva-led Stormwatch ready to engage them in the rubble! Both #18 and #19 include a Savant back-up feature, which finds her on a WildStorm version of Skull Island about to be betrothed to a King Kong before escaping via biplane where she has to fend off a gremlin on the wing.